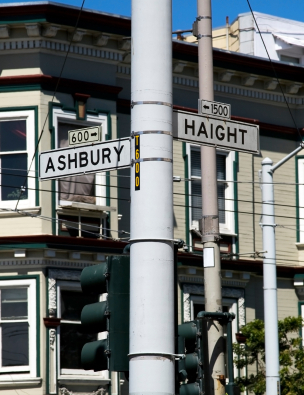 In the 1960's, an area in San-Francisco called Haight-Ashbury, the center for hippies and drugs, also became the birthplace and center of a major evangelistic explosion that extended worldwide known as the Jesus Movement. Calvary Chapel began in the Los Angeles area as a small church of about 150 in 1965 by Chuck Smith. By 1968, a young converted hippie through the Haight -Ashbury revival, began to bring many hippies and drug addicts to Calvary Chapel located in the Los Angeles area. Chuck Smith emphasized teaching the Word of God. This outpouring was so great that between 1968 and 1970, it is estimated that over 20,000 were brought to Christ with over 8,000 new converts baptized in the Pacific Ocean. Because many of those coming to Christ were rock musicians, it did not take long for Christian rock bands to form. Eventually, Calvary Chapel created Maranatha Music, transforming church worship and the music industry forever. Early pioneers in Christian contemporary music included Chuck Girard, 2nd Chapter of Acts, and Larry Norman, all of whom attended Calvary Chapel. Simultaneously, in the 1960's, John Wimber, founder of the Vineyard movement, experienced a dramatic encounter with Jesus in the Las Vegas desert when he was part of the Righteous Brother's band. John's conversion and passion for Christ led him to quit the band. John pastored a Quaker Friends' Church and from 1974-78 served as professor of Church Growth at Fuller Seminary. In 1977, John and Carol were led to join the Calvary Chapel movement, in part, because Chuck Smith's heart was to seek a balance between preaching the Word and seeking the Holy Spirit. During this time, he started a Bible study at Yorba Linda. He also associated with a group of churches within the Calvary Chapel movement known as Vineyard churches, which began in 1977, through a man named Ken Gulliksen. These churches hungered for more of the Holy Spirit and, in May, 1980, another outpouring of the Holy Spirit occurred, this time not only with evangelism, but also with healings, signs, and wonders. John Wimber's Yorba Linda Calvary Chapel grew from 400 in May, 1980 to over 1700 in three months, baptizing 700 people in their swimming pool. The following years, John Wimber began emphasizing the Holy Spirit and other Calvary Chapel pastors were drawn to the message of the Kingdom of God and signs, wonders, and church growth. By 1982, upon mutual agreement, the leaders of Calvary Chapel blessed John Wimber's church to align with the other Vineyards. A month later, the Vineyard movement was birthed. Those who are interested in learning more about this process are encouraged to read The Quest for the Radical Middle, by Bill Jackson. John Wimber, who had been a pastor and church consultant, was asked in 1982 to serve as the leader of a newly formed association of about nine churches (all in Southern California) that called themselves "Vineyard" (which could be traced back as far as 1977). As the leader of this new movement, known as the Association of Vineyard Churches, John pastored the pastors and trained and encouraged the planting of churches internationally. Worldwide, Vineyard churches have been planted in many nations, including the U.S., Canada, Mexico, Central and South America, Russia, Turkey, throughout the European continent, Africa, Southeast Asia, and Australia. There are nearly 1700 Vineyards worldwide. God has shown us, however, that His desire is not just to build the Vineyard or Calvary Chapels, but that we should promote His Kingdom, and encourage, build, and love the whole church. Which eventually gave rise to this current church named Chapel. To continue reading more about how we got here check out the Our Story page.